Blake brings a stylish touch to your home, giving you the perfect leather accent piece in your living room or bedroom that you've been looking for. 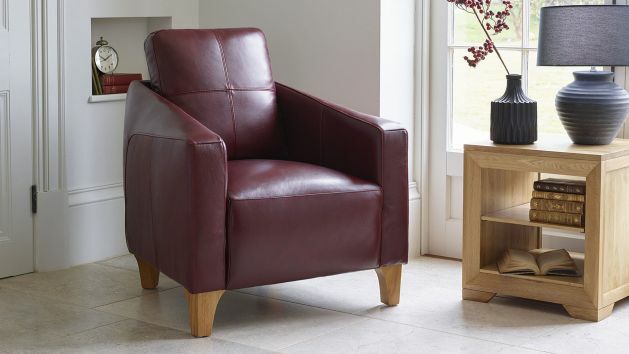 Our stylish Blake armchair is packed with classic design elegance. This 100% real leather chair features a sumptuous seating area and cosy high arms, for a supremely comfortable place to sit. Blake easily blends into both traditional and contemporary home styles with its simple shape, and stylish solid oak legs. It's upholstered in 100% real leather in a beautiful dyed finish. The seat is pocket sprung, which not only feels comfortable but also helps to prevent puddling and stretching of the leather, keeping this armchair looking its best for years to come. Don't forget, we offer free delivery to the room of your choice as standard with all of our products!